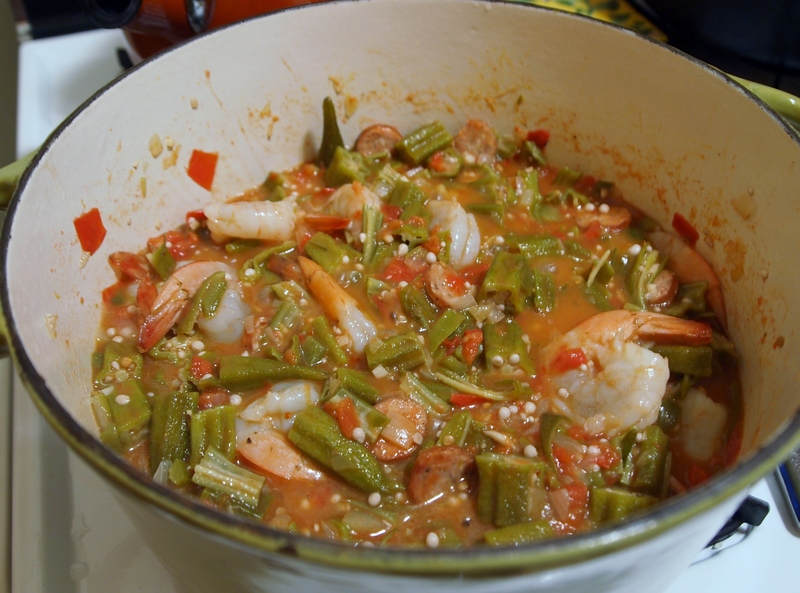 I learned how to make this Creole okra stew from friend Cliff Domio many years ago . . . let’s just say decades! But I haven’t made it in several years, and I’m not sure why it fell off my rotation. Maybe the difficulty finding okra here in the upper Midwest of the U.S. When I first moved here in the 90’s I almost never saw it at the farmer’s markets or grocery stores. Or maybe it was because not many people here were familiar with okra or avoided it because of its slimy reputation. So I had sort of forgotten about this dish. 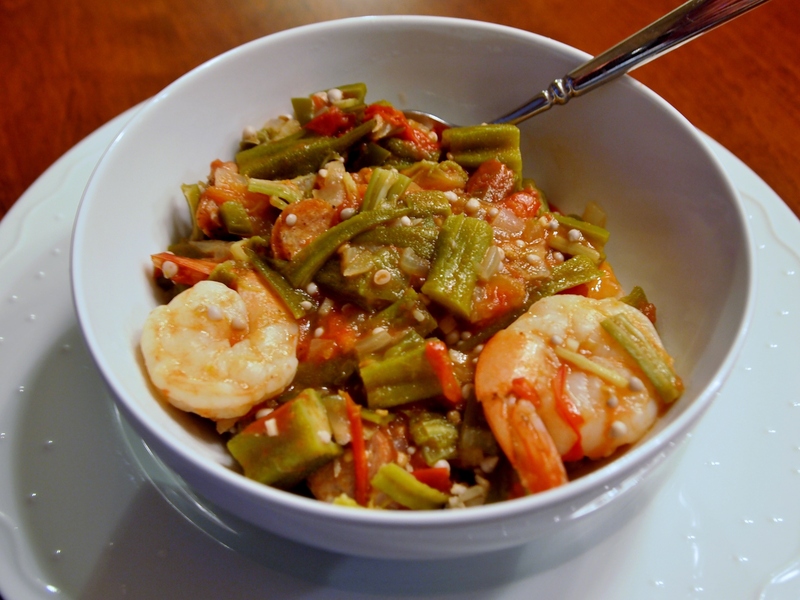 All of a sudden this year it seems that many of the farmers at the market have oodles of okra, especially the Hmong. (They are a great study in adapting to market demands and I wonder if the recent immigration from countries where okra is a staple has prompted them to grow it.) On a recent trip to the big farmers’ market downtown, I thought the okra looked really good so I decided to revisit a favorite. Serve this over rice for a satisfying meal. You might also consider a side of cornbread or a baguette to round things out. Saute the onion and green pepper in olive oil on medium high heat, stirring frequently, about 5 minutes or so. Add the garlic and the smoked sausage and saute for another minute or two. 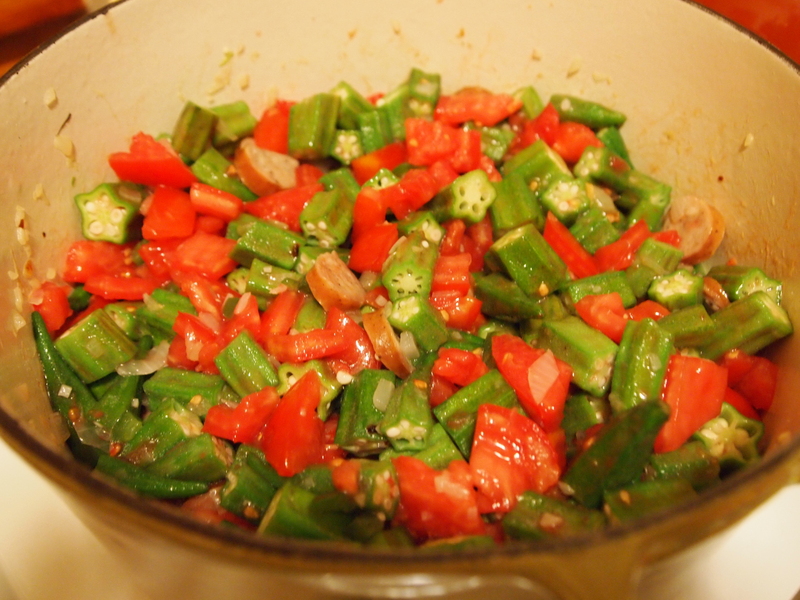 Add the okra and saute, stirring, for about 5 minutes. Note that if the heat is maintained, it won’t get slimy. Add the tomatoes, tomato sauce, if using, and crushed red pepper and stir to combine. 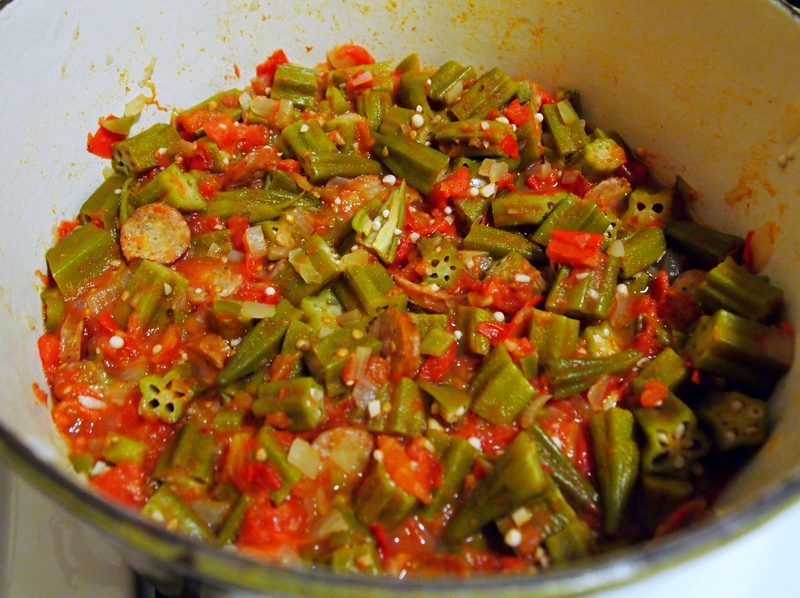 Bring to a boil, then reduce heat and simmer 45 min or so till okra is done but not massacred. Add the shrimp and simmer for another 5-8 minutes till shrimp is just cooked through. Serve over rice – we used brown rice. Enjoy! We’re the big farmers market downtown and we’re so glad you found good okra here! We’ll post this on our pinterest page. We love when people mention us by name and will share your recipe widely.